Forsaken Prince is the first book in a series of coming of age fantasy adventures. If you like original magic systems, imaginative monsters, and fast-paced action, then you'll love Andrea Pearson's series. 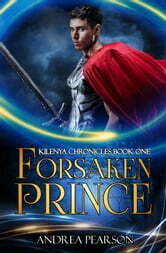 Buy Forsaken Prince today to join an epic quest fit for a prince. The Forsaken Prince has gone on a quest with some very unique characters to find his father the king and his sister. They have plenty of adventures along the way and some near death experiences. But since this is the first book in the series you know they don’t actually die. Some high action and tense moments keep the reader in suspense though. I would highly recommend this book to all young adults and older who still think they’re young ;;-). The story is well written and interesting. I will read the following books in the series. I do recommend it.